Ruby Marie Cary, 94, passed away on April 8, 2018 in Greeley CO. She was born at home in Crawford County, Iowa on March 20, 1924 to William and Emma (Kroeger) Schmidt. In 1947, her family moved to Loveland CO. Ruby met George Cary in Steamboat Springs CO. They were married on September 17, 1950. They were married 41 years. They owned a service station in Steamboat Springs. In 1958 they moved their family to Loveland. 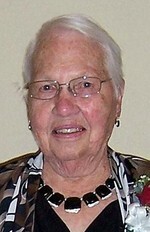 She was an active at Mount Olive Lutheran Church. She enjoyed the family cabin in North Park Colorado, playing cards and playing her button accordion. She is survived by her three daughters Jeanette Anderson (James) of Mountain Home, AR, Janice Mihulka (Charles), and Joleen Cary of Greeley CO. Grandchildren David Mihulka, Annie Mihulka and Robert Boxberger and 2 great-grandsons, sister-in-law and brother-in-law Mary and Joe Fuller, sister-in-law Betty Kemry and many nieces and nephews. She was preceded in death by her husband, her brothers Earl and Vernon Schmidt, her sister Bernice Kamprath. A memorial service is scheduled for April 20 at 11:00 am at Mount Olive Lutheran Church, 3411 S. Taft Avenue, Loveland. Memorial gifts may be made to Mount Olive Lutheran Church or Halcyon Hospice in care of Northern Colorado Crematory. To send flowers to the family of Ruby Marie Cary, please visit our Heartfelt Sympathies Store.